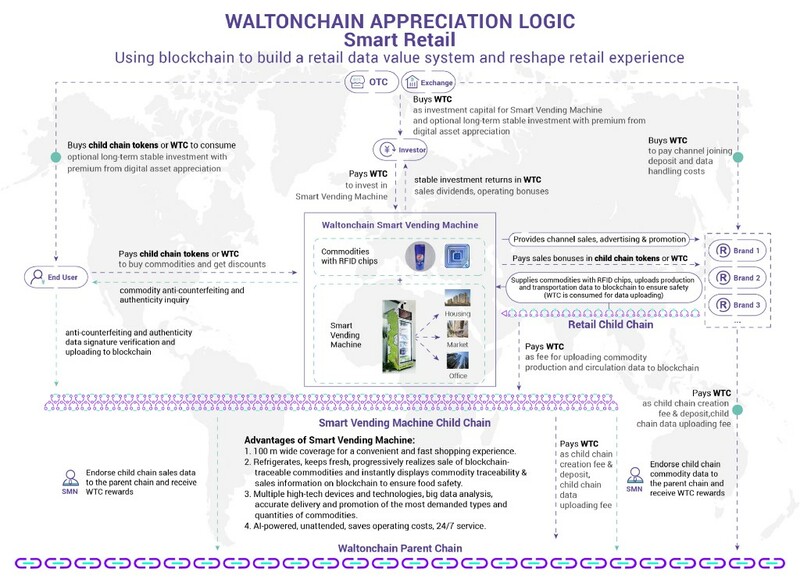 Waltonchain Smart Vending Machine (about to be presented) provides fast shopping and ensures commodity safety, consumption and fast replenishment. It also supports cryptocurrency payments and empowers fast WTC circulation in the ecosystem. Blockchain traceability technology ensures food safety, improves supply chain management and shopping experience, and brings value to brands, users and investors. 1. 100 m wide coverage for a convenient and fast shopping experience. 2. Refrigerates, keeps fresh, progressively realizes sale of blockchain-traceable commodities and instantly displays commodity traceability & sales information on blockchain to ensure food safety. 3. Integrates multiple high-tech devices, technologies and big data analysis, accurately delivers and promotes the most demanded types and quantities of commodities. 4. AI-powered, unattended, saves operating costs, 24/7 service. c) Commodity production, circulation and sales data can be queried on blockchain through the RFID chip on the commodity. Tamper protection, credibility, and food safety are ensured.